***** When a new theatre company made up of some of my favourite student actors and production crew invite me to the preview show of their new Edinburgh Fringe show, the only possible answer was yes. 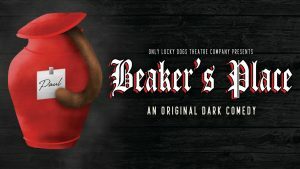 Beakers’ Place tells the story of Beaker, the meticulous owner of an illegal body disposal service in the cellar of his pub. Deeply affected by the recent demise of his cat, Paul, Beaker decides to take his own life – but at the crucial moment, he receives one last urgent delivery. Anxious to complete his own departure, Beaker is shocked when the bag begins to move. 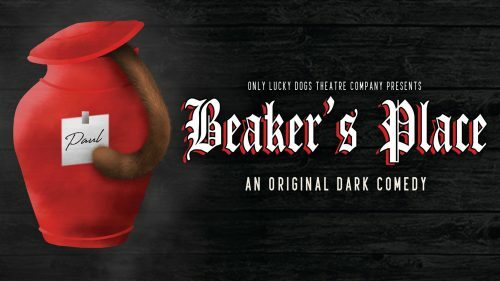 Beaker’s Place is a unique, exciting and chilling play that draws the audience in from Beaker’s opening monologue, taking you on a darkly hilarious and emotional journey full of unexpected twists, turns and character developments that will have you mesmerised throughout and on your edge of your seat. On the subject of seats, my best advice would be to get to the venue early and grab a front row seat in a dark and confined venue to see this play at it’s best and feel like you are right at the heart of the basement of Beaker’s Place. Writer James Huxtable has created a phenomenal script that any contemporary play writer would be proud of. One that’s not afraid to and originally tackles dark issues and complex characters head on and in extremely interesting ways, and that will never make you think about Pandora’s box, death or listen to “You Can Call Me Al” in the same way again. James’ writing is brought to life by the director Michael Saliba’s clever use of the stage and ability to get the absolute most out of the two actors whose natural talent and stage presence brilliantly and naturally brought their characters and the twisted power struggle and relationship between them to life. Matthew Bevan in his role as Beaker continues to confirm that he is an exciting young actor to watch, with an incredible talent for playing complex characters with multiple issues that audience members will be instantly drawn to and are unlikely to ever forget, as he moves seamlessly through dark emotions and and dark dilemmas and from disturbing thoughts to disturbing yet laugh out loud humour. Opposite Matthew, Lorna Dale as Drew in superb in her transformation, from at first acting exactly how much individuals would behave in the situation she found herself in, before cleverly peeling away the layers of her character to mess with both the minds of Beaker and the audience and leaving us at risk of never being able to thoroughly trust a stranger or judge a book by it’s character again. Beaker’s Place is an exciting new production by an exciting new writer and performed by two exciting up and coming actors and will be a must see show for anyone looking for exciting, original drama at this year’s Fringe (no apologies for the overuse of the word “exciting”). Anyone involved in Only Lucky Dogs is destined to go far and this show is a fantastic opportunity to see them at the beginning of their amazing careers. Being present for the show’s preview has made me incredibly excited for my visit to this year’s Fringe and if the shows I see in Edinburgh in August are anywhere near as great as this I will be thrilled. Established in 2017, Only Lucky Dogs Theatre Company is a student-led theatre company based in Sheffield that aims to deliver the best in original entertainment, tackling fresh new writing with some serious bark, they put energy and excitement centre-stage. For further information like them on Facebook at www.facebook.com/pg/onlyluckydogs or follow them on Twitter at https://twitter.com/OnlyLuckyDogs. Beakers’ Place will be performed daily from Friday 3 to Saturday 25 August (no show on Sunday 12 and 19) at 12.25pm at theSpace on North Bridge – Argyll Theatre. Tickets are £8.50 full price and £7.50 concession. To book visit https://tickets.edfringe.com/whats-on/beaker-s-place.